Pie Tee or Top Hats is a familiar snack or finger food to many. 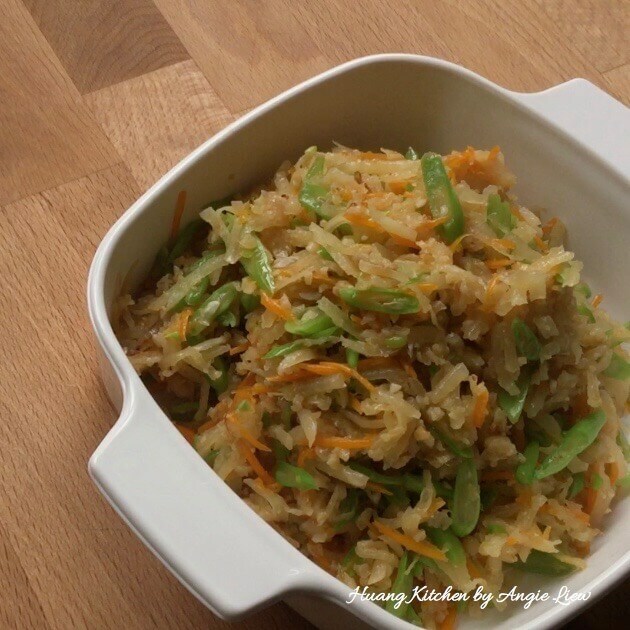 It is filled with a savoury filling of juicy yam bean (turnip) and toppings that can be elegantly eaten in a single mouthful. This is a popular asian snack served in Nyonya eateries and also most of the food stalls in Malaysia and Singapore. 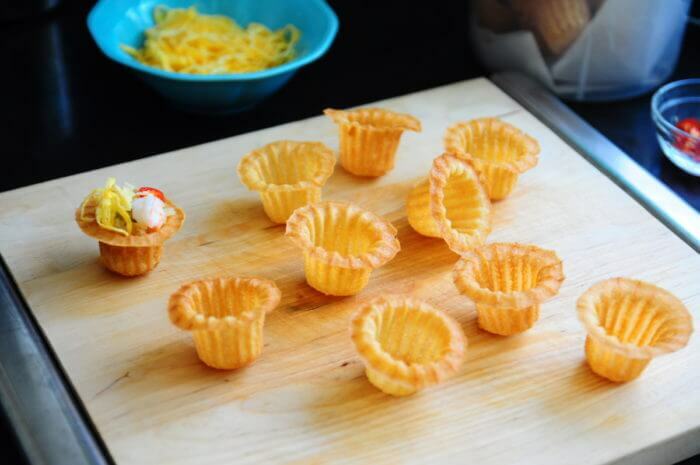 Pie Tee is just great for a brunch or tea party and is very popularly served during Chinese New Year. Everything can be prepared in advance. So you can just sit back and relax, watching your guests enjoy themselves making their own little pie tee. 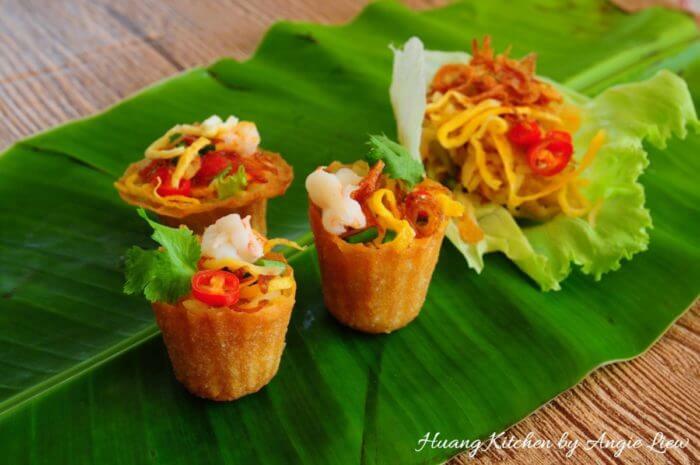 We simply love to serve this alongside Popiah as well! 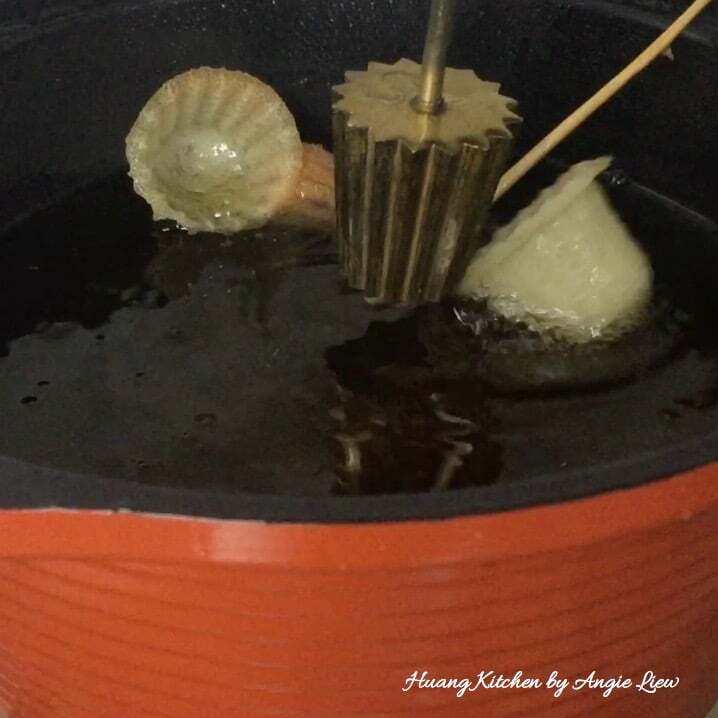 Making kuih pie tee is a two step process. First, is the making of the pie tee shells. Although effortless to eat, making the pie tee shells may require some patience, skills and practice. 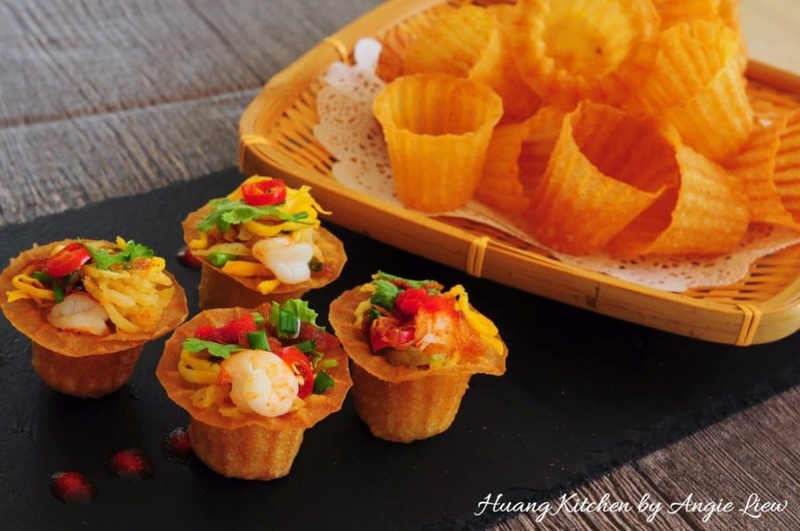 Nevertheless, the effort is truly worth it when you finally take a bite of the delightful crunch from the vegetables against the light crispy textures from the deep-fried shells. 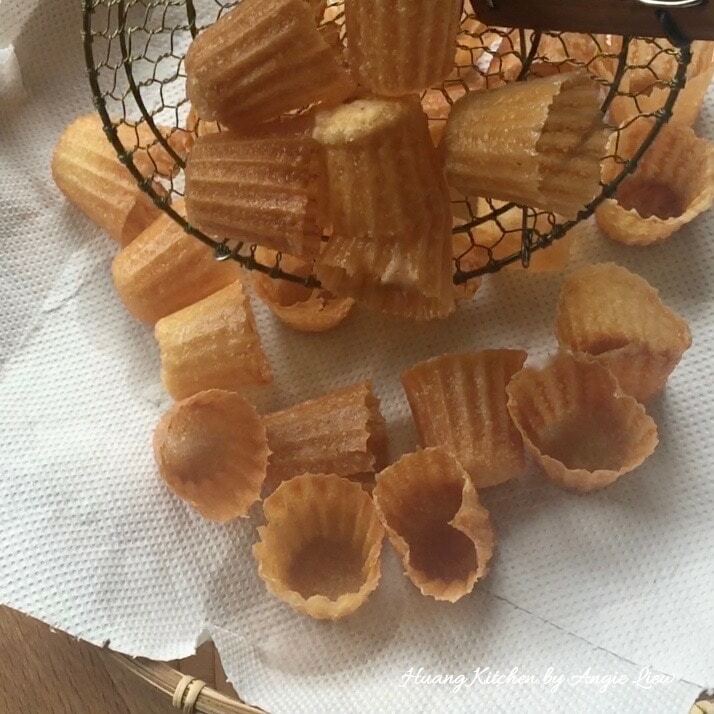 These pastry shells can be made ahead of time and kept in air-tight containers until needed too. Then, is preparing the filling and the toppings for the pie tee. 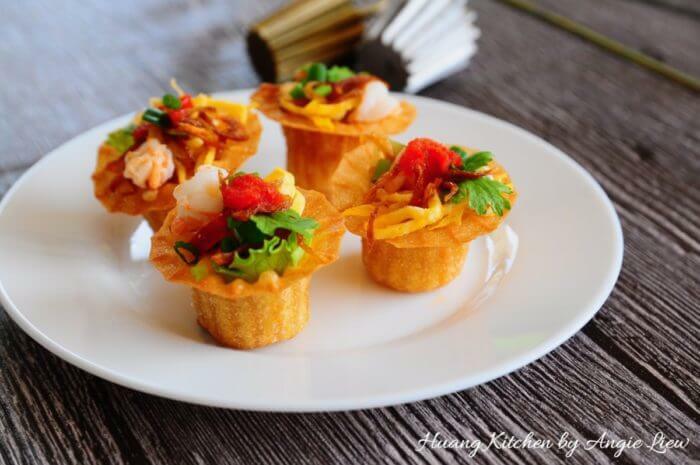 Savoury yam bean filling filled with the fragrance of dried shrimps, topped with shredded omelette, shrimp, crispy fried shallots… Enjoyed with the delicious homemade chilli sauce, this experience is TRULY amazing. You will definitely not stop at one, that I can assure you. As always, Enjoy! 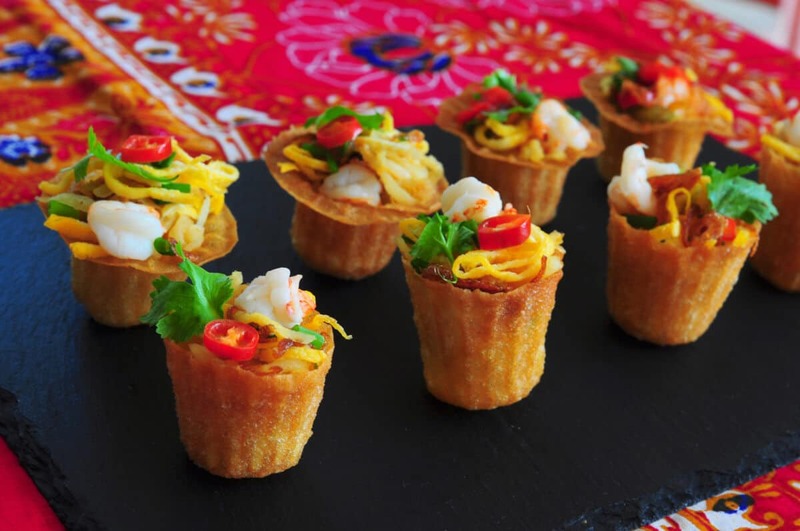 This bite-sized snack is stuffed with flavourful ingredients in a thin and crispy shell. It's easy to prepare, its fun and delish. 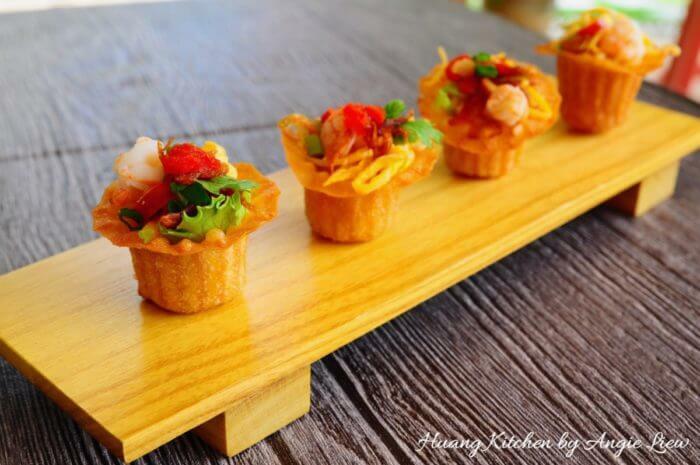 Terrific for any tea party and makes a great finger food too! 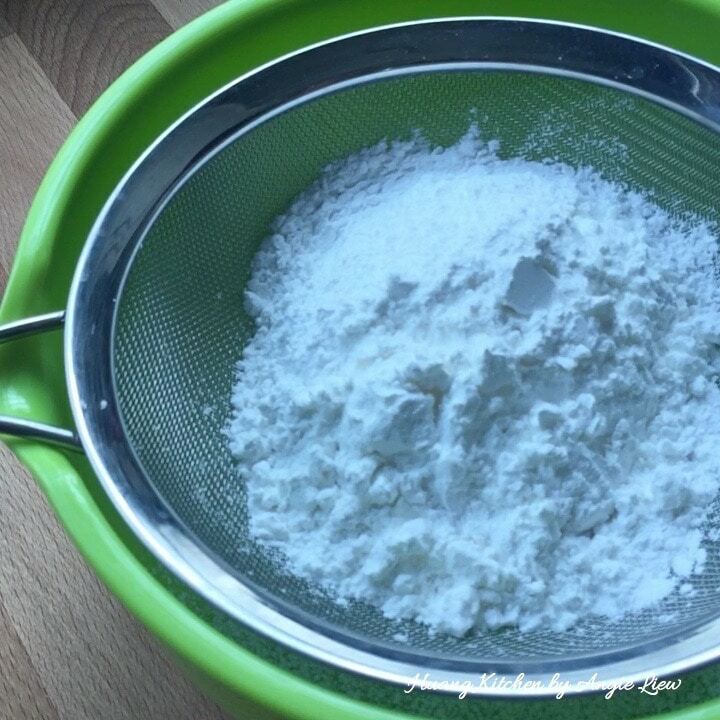 First, sift all-purpose flour, rice flour and cornflour into a mixing bowl. Then add in salt. 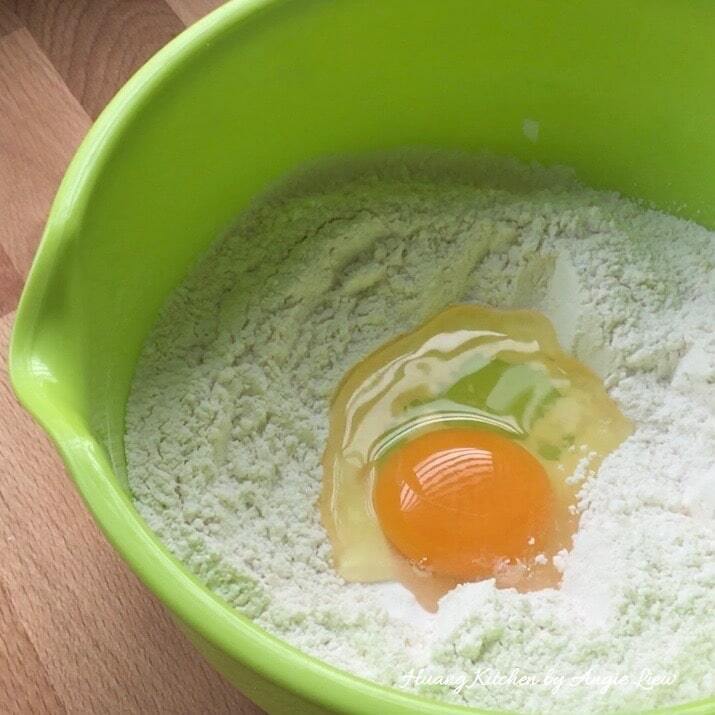 Make a hole or well in the centre and pour in an egg. 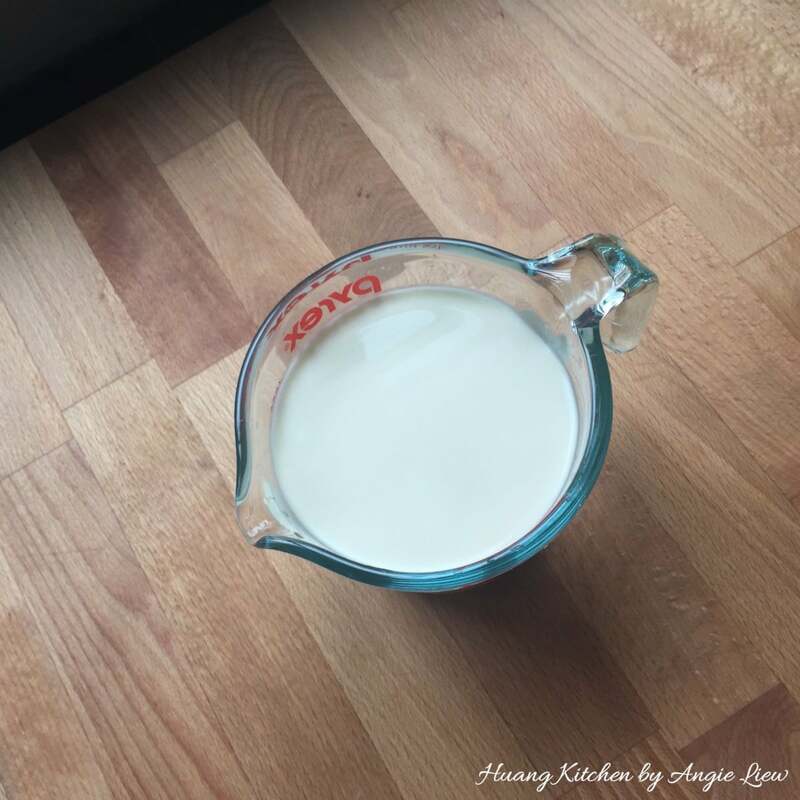 Using a whisk, stir in one direction to mix in flour. Then in batches, slowly add in water. 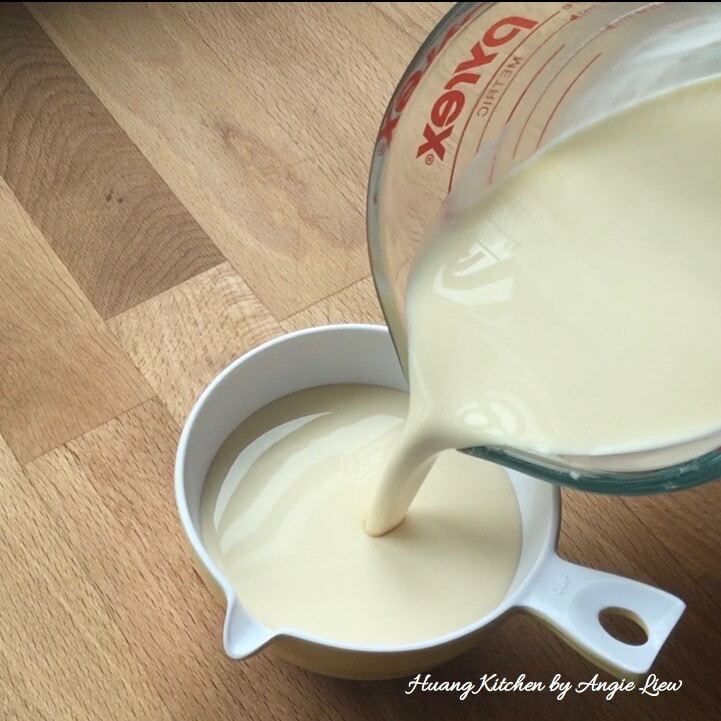 Continue to mix until a smooth batter is formed. 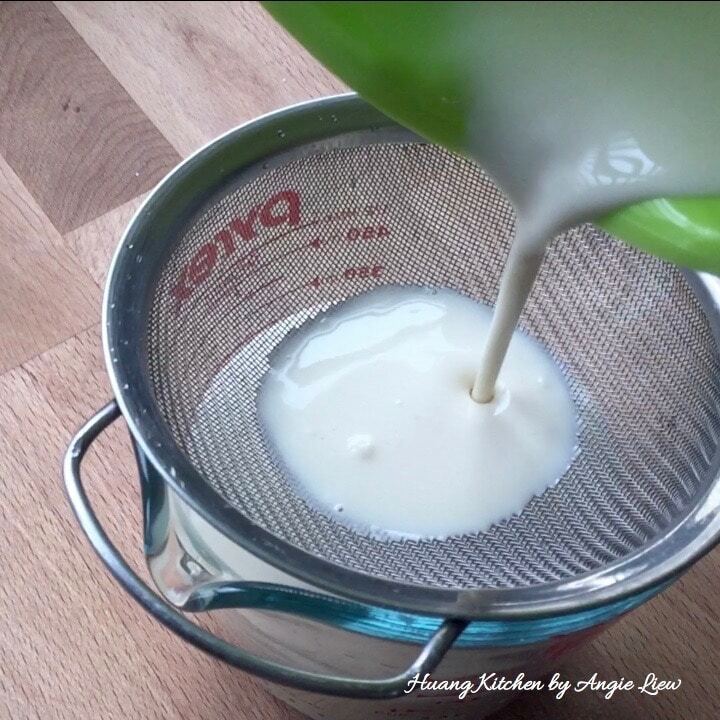 Using a strainer, strain batter to remove any lumps. Leave batter to rest, preferably 1 hour or so. And we're ready to fry the pie tee shells. 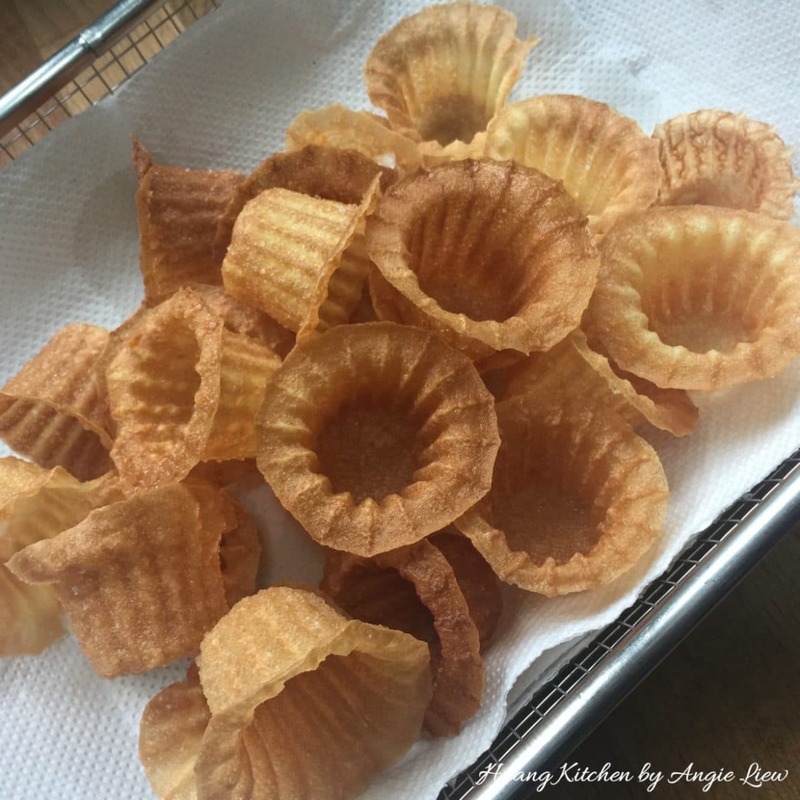 Before you start frying, pour the batter into a small cup. This cup should be wide and tall enough to completely submerge the pie tee mould. 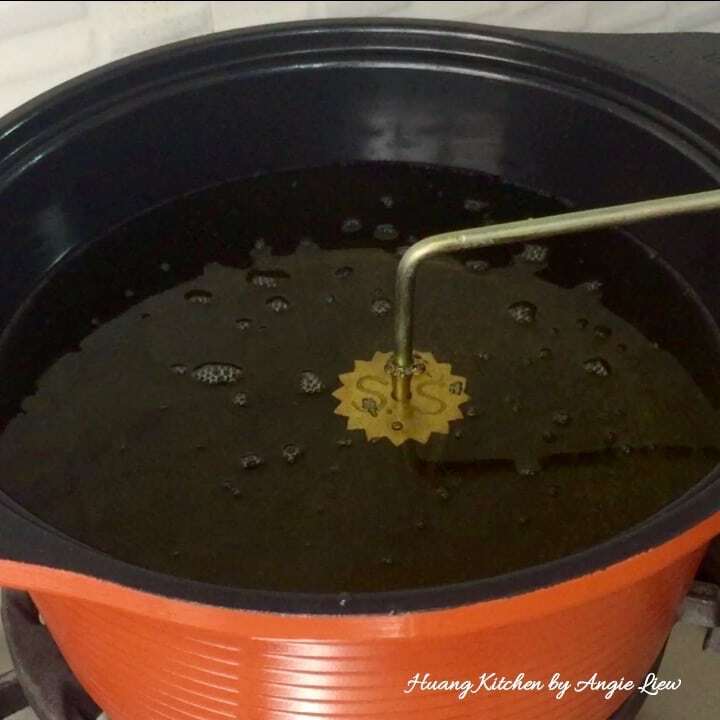 In a small pot, heat oil for deep frying. Test oil temperature with wooden chopstick. 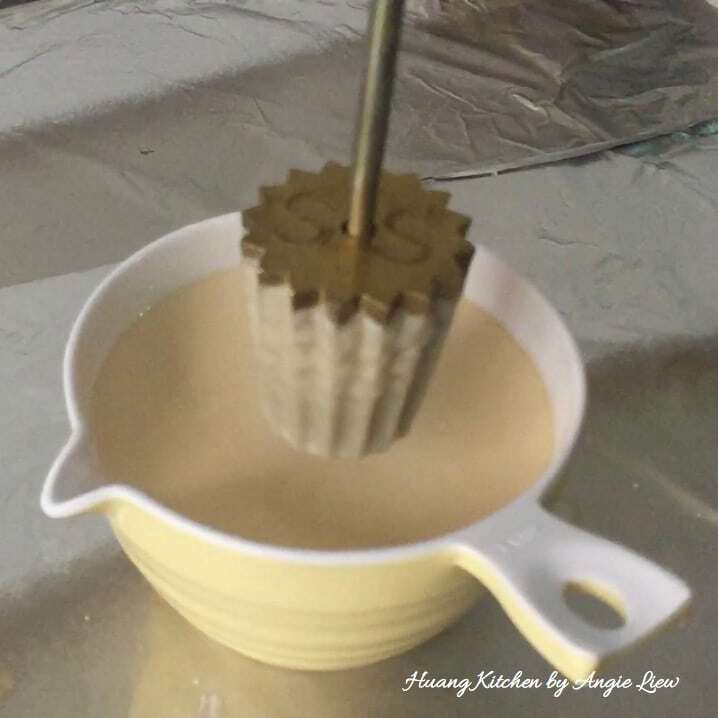 To heat up the pie tee mould, fully submerge the mould in the hot oil. Do not overheat the mould. Once mould is just hot enough, lift up and shake off any excess oil. 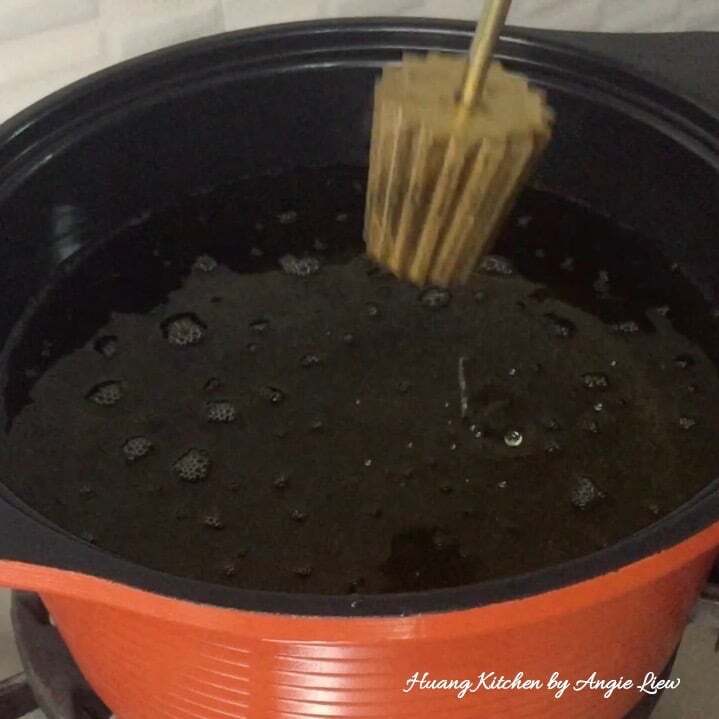 Removing excess oil ensures that the batter sticks properly to the mould. To make regular Pie Tee shells (no brim): Dip mould vertically into batter until almost to the top, about 95% of the mould. 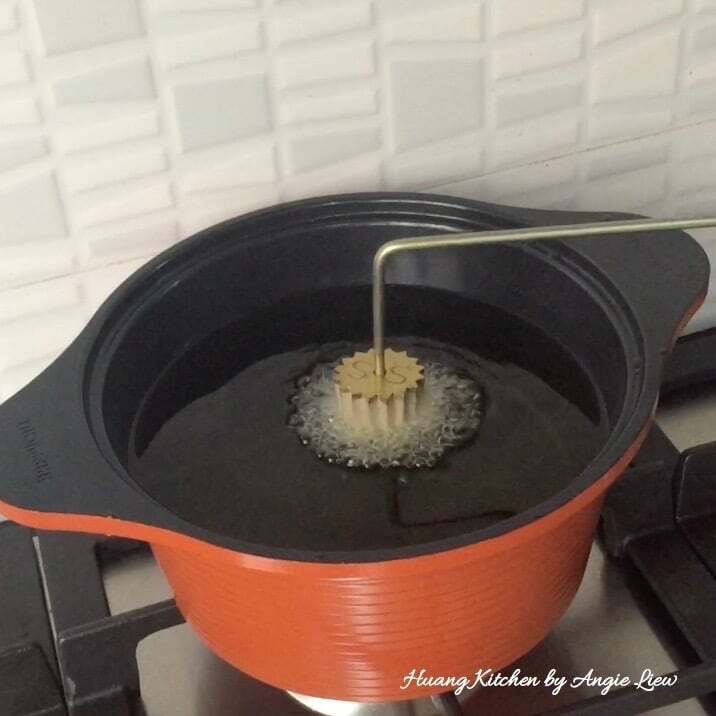 Then dip it again gently into the oil until the mould is almost fully submerged in oil. Wait till shell turns light brown and can be separated from the mould. Jiggle/shake the mould up and down to loosen up the shell, then remove shell with a chopstick/thin stick. Be careful not to break the shell in the removal process. 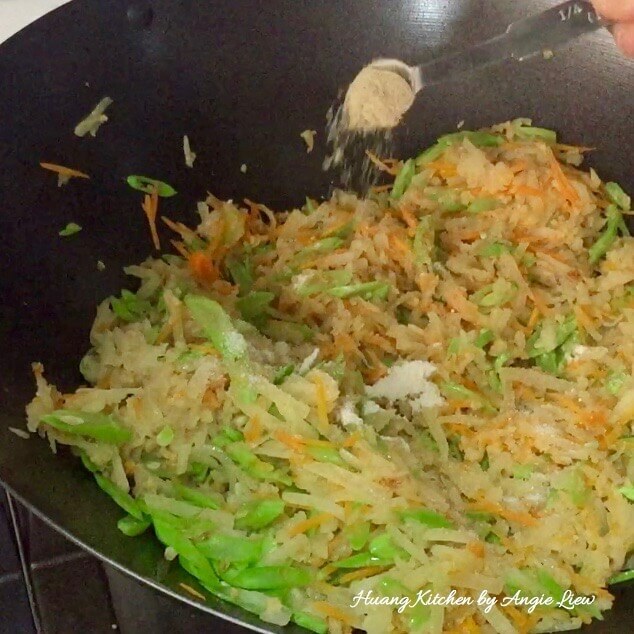 Continue to fry until golden brown, then remove from oil. 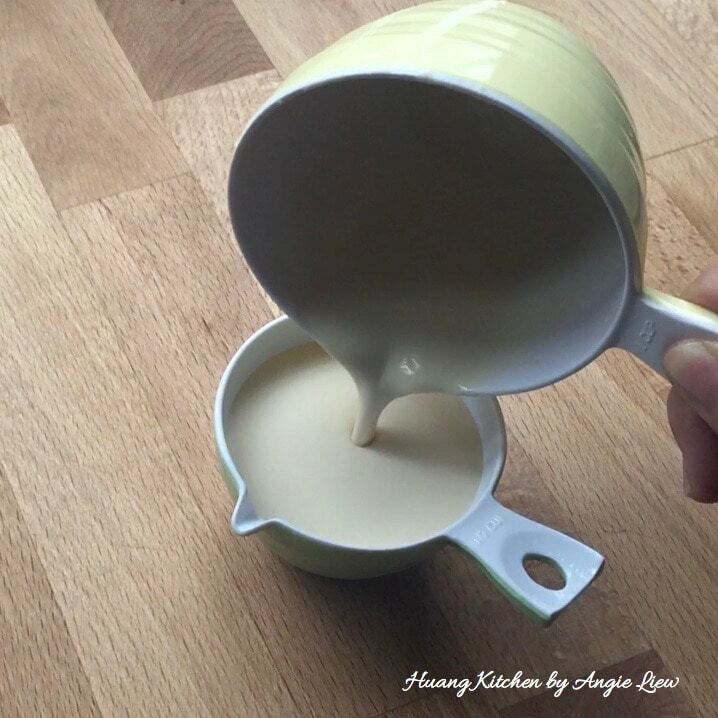 Repeat the steps above until almost all the batter in the cup is used up. Once the batter level in the cup becomes too shallow, pour the batter into a smaller cup, wide and tall enough to completely submerge the mould. 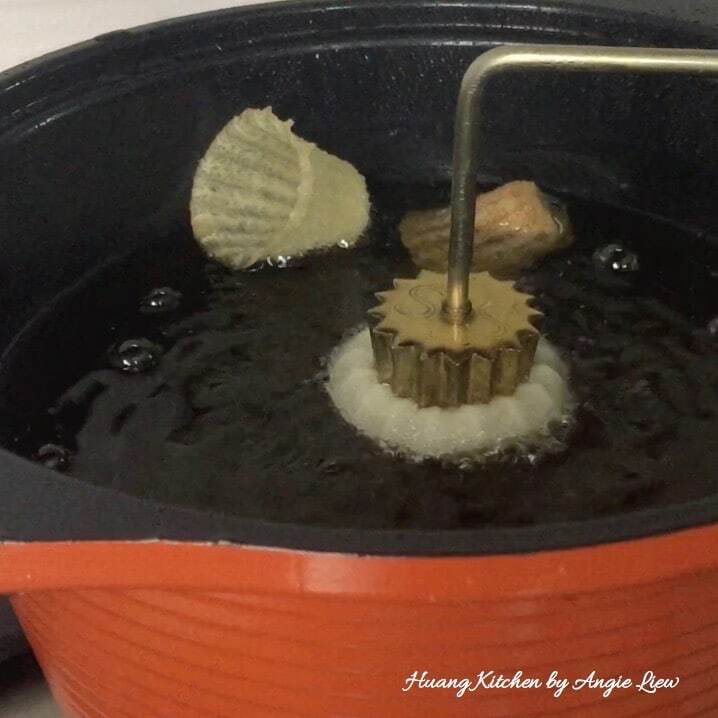 Drain the fried shells on paper towels. Cool completely before storing in an air-tight container to keep them crispy until needed. To make brim shaped Pie Tee shells (Top Hats): Dip mould vertically into batter until almost to the top, about 95% of the mould (same dipping method as making regular Pie Tee shells). To create the brim, dip into hot oil, then immediately lift up the mould so that the shell opens up like a flower. Wait till shell turns light brown and can be separated from the mould. 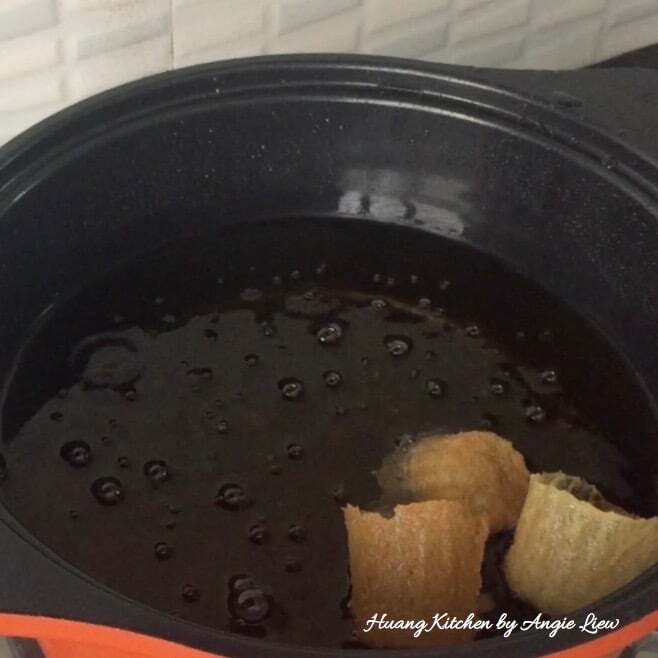 Drain the fried pie tee shells over paper towels and store in an air tight container once completely cooled. 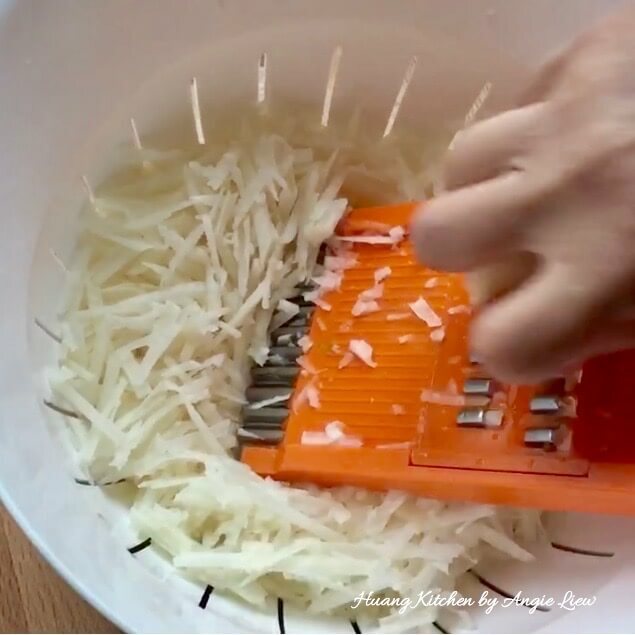 First, shred turnip into thin strips. 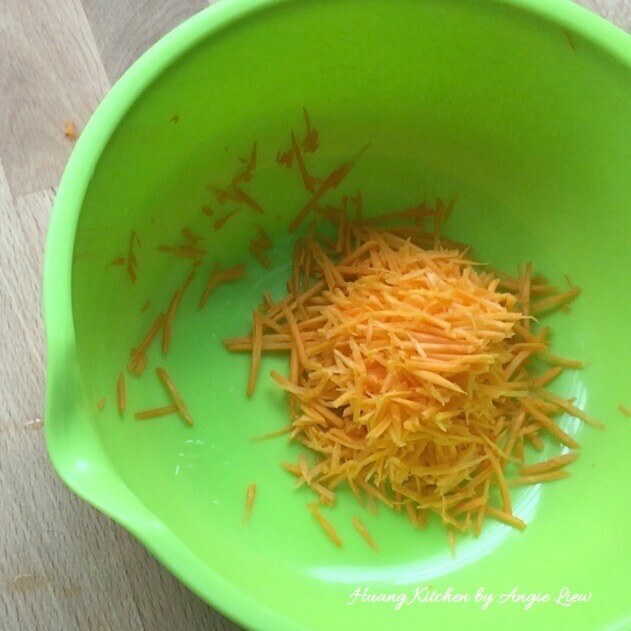 Shred carrot into thin strips. 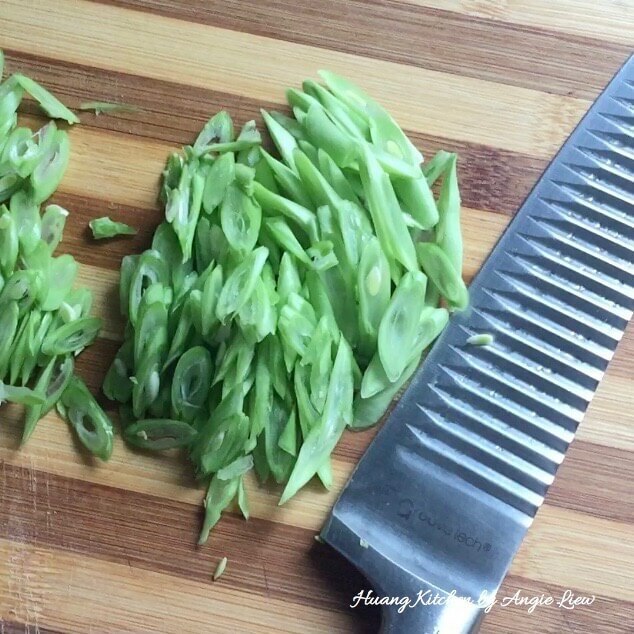 Shred french bean into long thin strips. 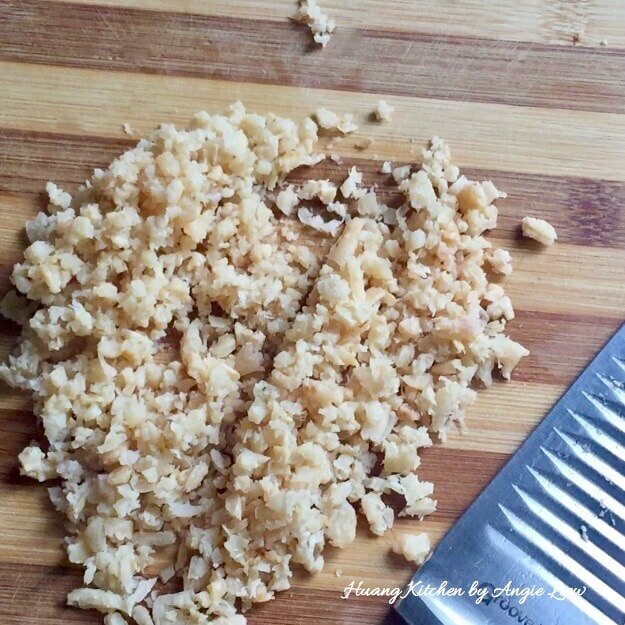 Soak and chop dried shrimps. 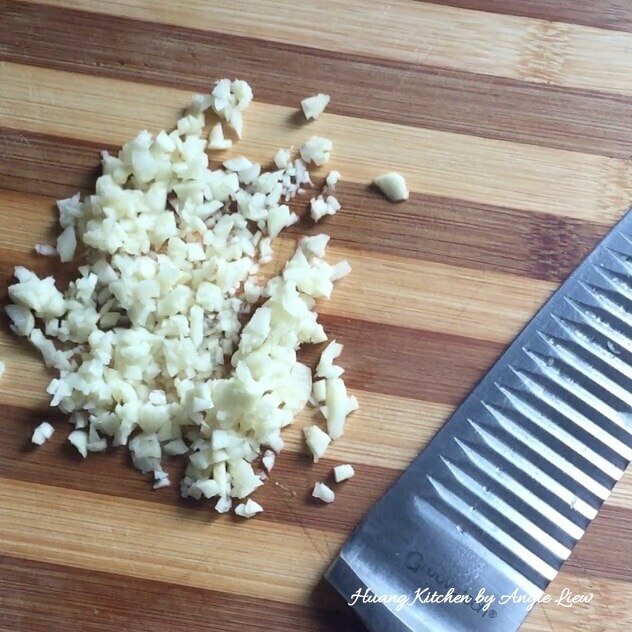 Peel and chop garlic. And we're ready to fry the filling. 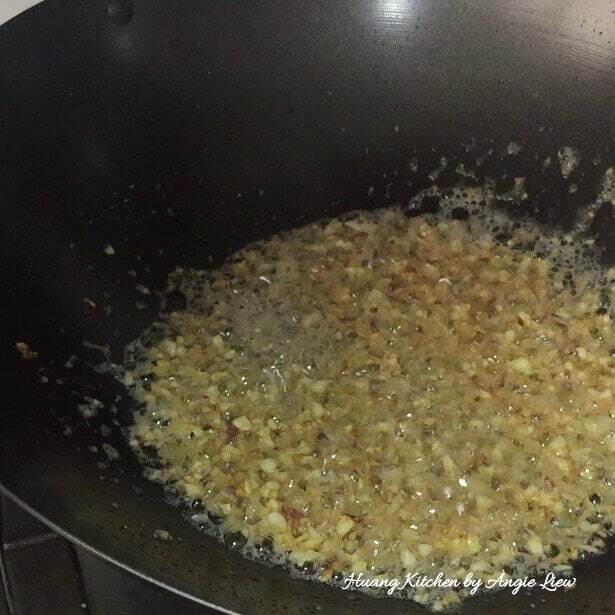 First heat up oil in wok and saute chopped shallots and garlic. 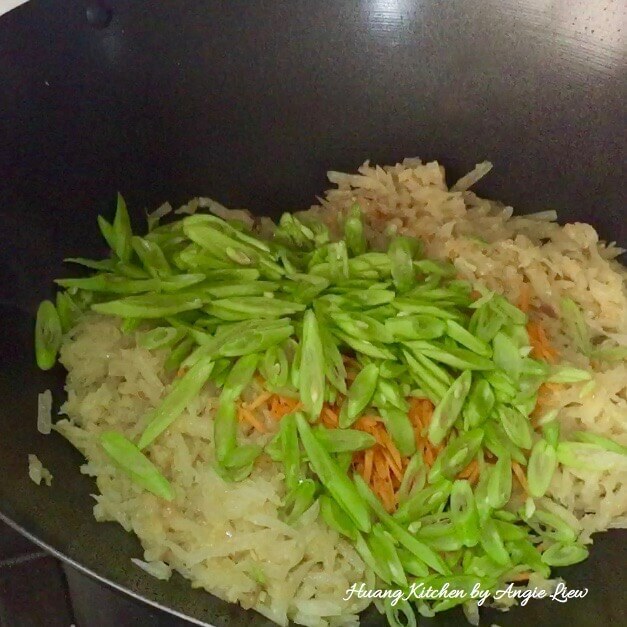 Then add in chopped dried shrimps and fry till fragrant. 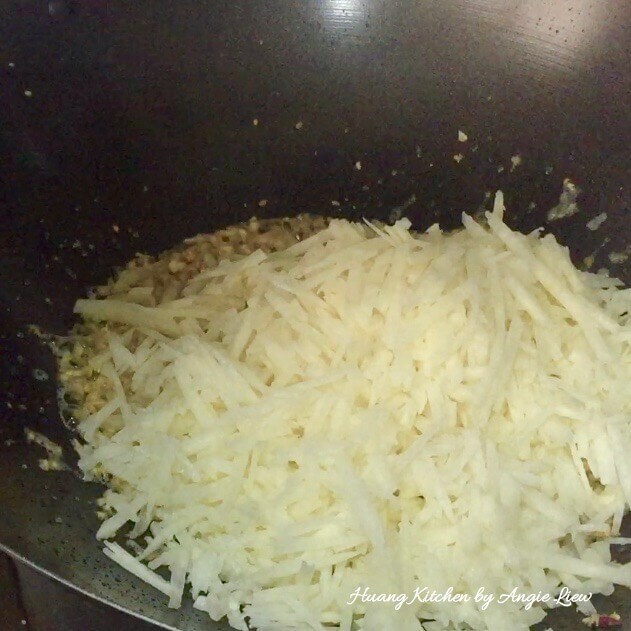 Add in shredded turnip and fry till well mixed. Next, add in shredded french bean and fry briefly. Lastly, add seasonings and fry till well mixed. And we're done! Dish up the fried turnip filling into a casserole. Then, using a wide non-stick pan, make a thin omelette. 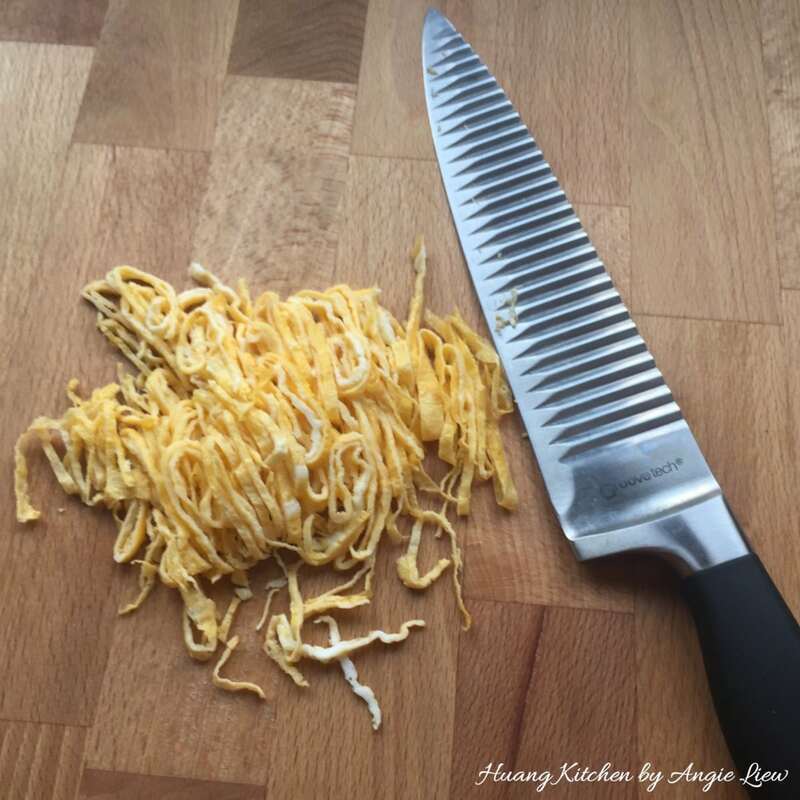 Shred the omelette into long thin strips. Assembling the pie tee: First, put a small lettuce piece into pie tee shell, then stuff with turnip filling. Top with shredded omelette and shrimp. 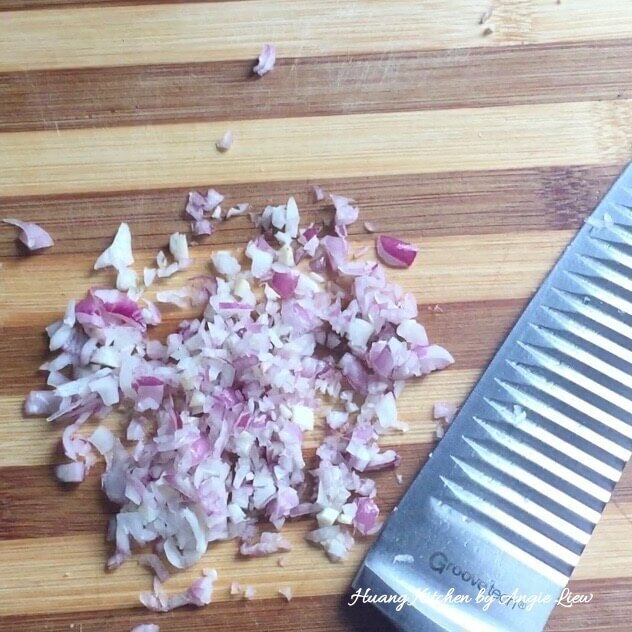 Lastly, garnish with crispy fried shallots, spring onion, red chilli and coriander leaves. 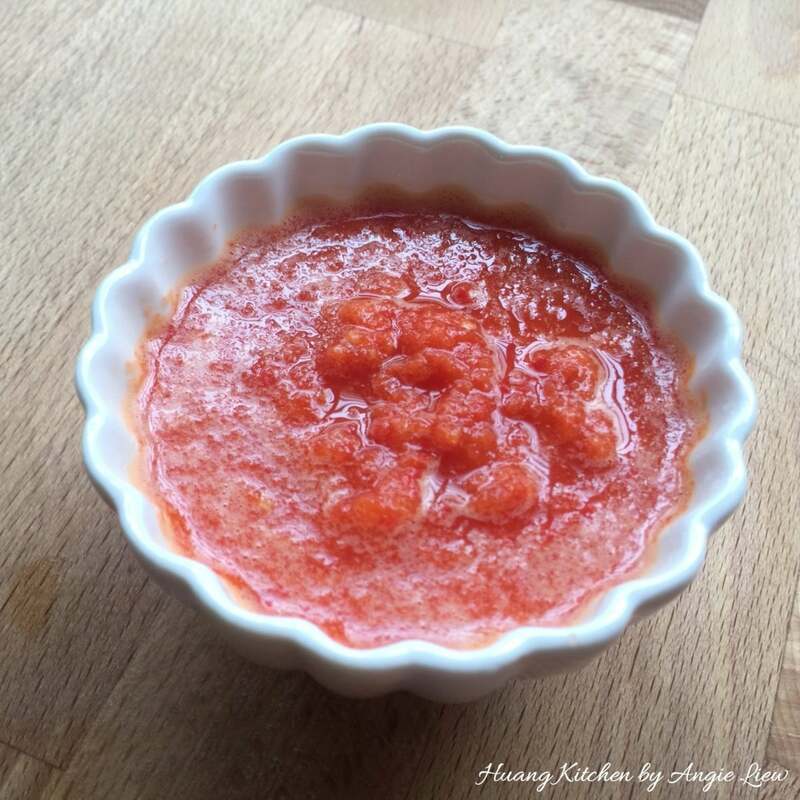 Serve chilli sauce on the side or drizzle on top. 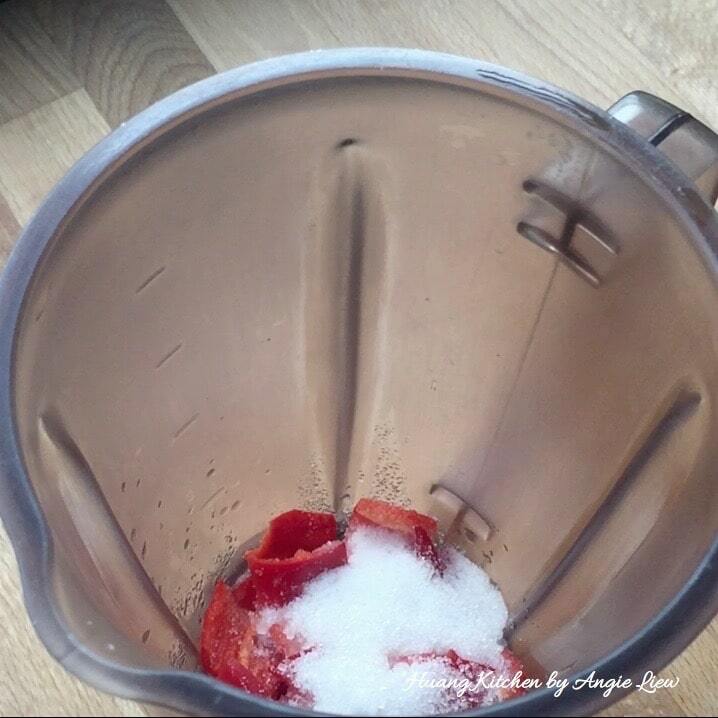 Place cut red chillies, garlic, ginger, sugar, vinegar and salt in a blender. The ratio of flour used is 1:1 and the ratio for flours to water is 1:2. Set aside the batter for an hour or so before making the pie tee shells, as this will allow the batter to thicken before use. Oil temperature is one of the most important factor to make good pie tee shells. It should be slightly lower than the usual oil temperature used for deep frying. High oil temperature will create air bubbles on the surface and holes at the bottom of the pie tee shells. 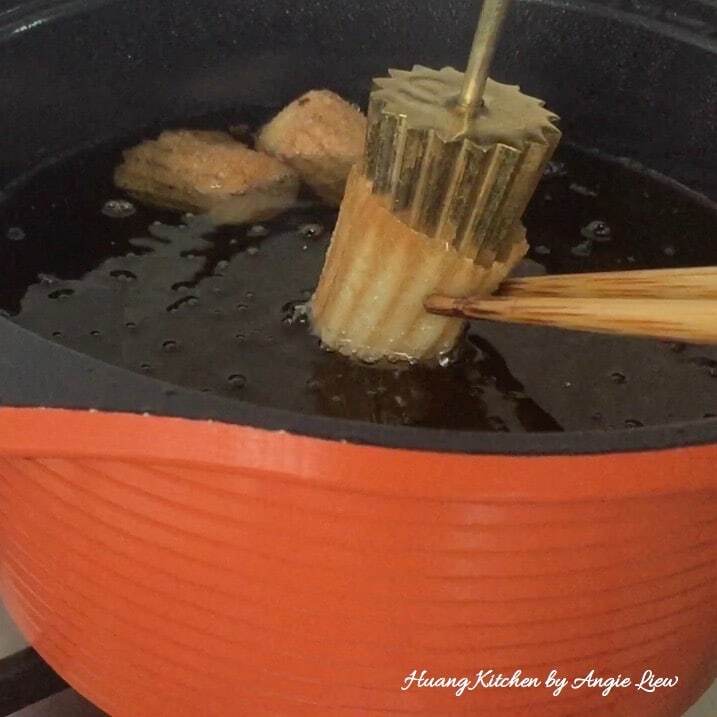 To test the oil temperature, dip an unvarnished wooden chopstick into the hot oil, a small trail of bubbles will form along the tip. Drip some batter into the oil. 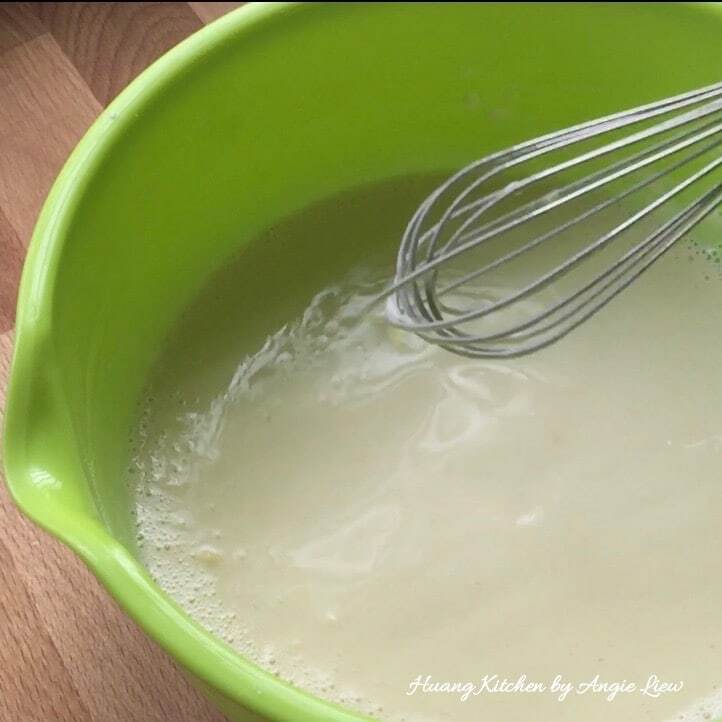 The batter should sink all the way to the bottom before quickly floating to the top again. Store fully cooled pie tee shells in air-tight container to ensure that they stay crispy. If properly stored, fried pie tee shells can be kept up to weeks.